This entry was posted in Sew Along! and tagged 1911 - 1919, 1912 Project, Edwardian, Titantic. ← It’s All About The Men! Brilliant idea! Count me in!!!! I can’t wait!! Very cool, I’ve never sewn something from a pattern that old but it sounds like a worthy challenge! You will LOVE it Molly! 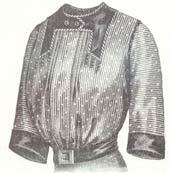 I have sewn from 1800s patterns. A little adjusting for modern fit, but well worth the time. I would love to do this! I’ve just started looking more at this era of fashion precisely because of all the resurgence of interest for the centennial, and I would be thrilled to try some vintage patterns. I am so in! I am emailing you right now! Wow this is so amazing! I’d love to help! I’ll send that email asap and blog about this today! Please count me in. I’ve sent an email. I have a blog that I intend to launch in the new year. I’d also be game for posting to VPLL as well. This is a dream. I would love to take part. Can’t wait to jump into this project. Email sent. I would love to participate in doing this! I am an elementary school teacher, but love to sew and have a background in sewing and textiles from my college days. My daughter is a connoisseur of vintage fashion as well. I am learning a lot from her! Daughter now teaching her mom. I would love to do this, have been thinking of starting a blog. This might be the push I need to do it. YES i want to join!! I’d be happy to start a blog if necessary to get in on this project. Count me IN! This is right up my alley! I will FIND the time to make these ethereal gowns and thrill in every moment! Out comes my elegant wools, my exquisite chiffon’s, my magnificent silks, my finest linens and my delicate laces. My sewing machine will be a buzzing, whirring whirlwind and I will be in my own little Heaven. HOW many gowns will you allow me to make for you??? 🙂 I think I will make a hat to go with it!! Oh this sounds lovely and just the inspiration I need to get myself up and running on a new project. I would love to participate!!! The costuming in the recent Titanic movie was fabulous and I would jump on the opportunity to make some of those fashions for myself. Absolutely interested in this project. I just finished a steampunk costume of the victorian era and enjoyed making but would love to try my hand at authentic period clothing. I’m so excited to start this project. I would be very interested in this project and have just sent off an email. Hopefully you will have some men’s clothes to re-create! What a great idea for the 100th anniversary! And I was just planning to start drafting & draping some of my own patterns for dresses of that time period in the next few months. I will send an email to see if I can help out with your pattern testing as well. I would love to participate in this project! I have a degree from Seattle Central Community College in Apparel Design, and many, many years of experience. Don’t do much pattern making or drafting anymore, but can test your patterns. I also have a notebook I did years ago for a class project, “Fifty Years of Fashion History” in my family. It has 101 photographs of family members in clothing mostly made by my very talented grandmother, about 1900 to 1950, in Wisconsin, Chicago and Seattle. That sounds pretty awesome Chris! I would love to see the Fashion History that was made with your own family!! That is remarkable!! I have never seen that done before!! What a family treasure. What an honor it would be to participate. Count me in. I have a daughter who is perfect for modeling these creations. I would love to also, will email you. I would love to be a part of this project. Let me know how I can help. made several Titanic outfits and would love to participate in this! I would love to participate in this project. I already have an Edwardian wardrobe, a couple of original items. but mostly reproductions that I have made. We have several Horseless Carriages (cars manufactured prior to 1914) and the tours arranged for these vehicles encourage dressing in fashions from the era. It would be fabulous to have actual patterns from the era to sew.Including for the gentlemen who restore the cars and drive them. I am an experienced seamstress. From a business point of view, what is the point of this project aside from getting publicity (for which it so far seems very successful? Are you crowd sourcing digitization, translation from French, writing modern instructions, or what? Since in my experience the original patterns do assemble well, and any size alterations will only work for the person they are done for (because the patterns are in one size), I don’t see a lot of technical advantage in having muslins made, especially by people who don’t have much experience in assembling clothes from this era (because of course some of them will, but many won’t). I can see the advantage to people who sign up in getting at least one free pattern, but not much advantage to you other than marketing. Though it is a very clever marketing idea. Just interested, as I’ve published several books using similar patterns. Frances – thanks for your comments. Your contributions in the area of historic fashion is well known – and in fact I own two of your books on earlier eras. Unfortunately you seem to have misunderstood the point of this project. It did not originate as a marketing idea. I have been wanting to start my Harper’s/La Mode project for quite a while – and after finding the Unsinkables on Facebook, thought that the 1912 issues would be a timely starting point – given my own Titanic obsession. Knowing how I can sometimes easily get off track on a project, I thought that having a few people willing to play with the patterns as they were created, and waiting for new ones – would help me set and meet deadlines to making the next ones available. So, I put out a call on my blog looking for a few folks who’d blog post about their experiences working with the patterns in exchange for receiving copies of them free. This was envisioned as a community project, where people interested in the era could exchange ideas, their sewing tips and skills, history about the era – or really anything at all – via email and their blogs. I neither anticipated nor planned for the huge response. I did not contact any media outlets. I posted about the project in two places only, my blog and on the Unsinkables Facebook page – as I thought that those who were already planning for Titanic events might be interested. What started out as a method to help me achieve my goal of publishing every individual pattern from the 1912 year of La Mode – has now turned into a much larger labor of love. These past few days as the responses have come pouring in, I have spoken to so many amazing and talented people from all over the world who love historic fashion – and are fascinated with the 1912 era and the Titanic. Am I “crowd sourcing” the work that this project will demand? In a word no. I am doing all of the labor myself. (Of course I won’t turn down any offers of help!) There is no technical advantage in having muslins made – because I won’t be using them for anything – they are entirely the property and for the use of the folks who are creating garments for themselves. Because this project is likely to last the entire year – I expect the participants to receive not simply one pattern – but several – or as many as they think they can sew in any given time. The only business advantage is – at the end of 2012 if all goes well – all of the patterns from 1912 will be available on my website for purchase. That is a net gain for the costuming community at large, I hope. Long term having a wider selection of patterns will be a net gain for my business, as I will be able to stay in business during these tough times and continue to provide the service that I do. Short term for this project – I do not expect to make money on it. I did not write my original blog post with that expectation. This project is about the people who have asked to be involved. It is about connecting them together, and sharing both the pitfalls of working with these patterns and the triumphs. It’s about doing something amazing to recognize the impact that the historical events surrounding the Titanic represent. Most of all – it’s simply about having fun and sharing the passion of this era. Not everything is about business. This project least of all. I love this response and I love the spirit of this project. I would be happy to volunteer my time in any way that might be helpful! I am sort of offended by Frances’ response. I am an ordinary sewer who is helping with this project. I am bringing my experience and viewpoint to it. I stumbled upon this project and signed up the same day! am not a costumer nor a couture seamstress. But, I am happy to stretch my abilities. Not everything is about marketing and money. Janyce, you go girl!! Frances, I must say I’m glad I discovered your work after reading your email. I knew nothing about it. From a non-businesss person perspective, I’d rather support your work and business and the one at vpll than, say, huge multinationals that are passionate only when it comes to quaterly results and profit charts and who care exclusively for their stockholders dividends and their CEOs obscene pay checks, brainwashing us and our kids, to sell stuff and trinkets with built-in rapid obsolescence, produced at a huge human and environmental cost. Vpll said she didn’t start this project with a calculated and thouroughly planified marketing agenda. I believe that. But I also think there’s no harm for you or vpll or any other value-added business run by real people to make yourself visible so we can see you. Two days ago, I didn’t know about your books or the vpl, and I’m glad I know about you now. It wouldn’t has happened if The 1912 Project didn’t appeal to me and stoped me in my tracks as I was about to hit the delete button on that newsletter in my inbox. Times are hard for everybody. Disposable incomes seem to be shrinking at record rates and speed. There are individual choices we need to make so to support the real economy with what little money is around when necessities are covered. We need to support a real economy populated by you, vpll and hopefully, a growing number of people who realise we need to do business differently. For that we need to know you’re out there. I’m totally aware I have no experience what so ever in that type of sewing. I think that’s what’s interesting about this project. It seems, from the comments above, it’ll help bring people with a solid knowledge and people with none closer and make for an interesting and lively community activity and exchange. And yes, you are right, there probably will be volunteered translations, volunteered technical advice, voluntered historical research and so on, for the benefit of all, not just vpll. It always struck me as totally strange that one should choose to volunteer for the Olympics for exemple. My reasoning is: Ok, this will bring h.u.g.e. revenues to the different levels of governments hosting it, h.u.g.e. revenues to advertizing agencies, obscene revenues to multinationals (think about how much coca cola, Mcdo and the like benefit from that kind of event), any loss is socialised (we absorb it through our taxes for years). Not only very little of those revenues are redistributed down to communities, but our athletes’ families fork their own money (at least here in Canada) to support their champion kids and the grunt work is made for FREE by volunteers who genuinely think they are helping their communities and their national image while all they do is help those who already benefit hugely benefit even more, and remove possible part-time jobs from the market. I’d rather help a small business who in exchange, allows for access to invaluable (to me anyway) information and historical patrimoine and might prosper, at least securing the owner’s job and maybe more. I would love to participate! I actually purchased numerous similar historical information from this era! After a breast cancer diagnosis at 41, at 43 I became pregnant and my healthy son was born April 14, 1994 at 11:50pm, full term, due date..I was as big as the titanic i think! LOL! I see that my comment is awaiting moderation..why? I’ve just been overwhelmed by the sheer amount of responses to the project – so I’m running as fast as I can to get everything organized and the first of the patterns out the door. Wonderful! Are you still contacting people to participate or have you already chosen the participants? I emailed awhile back, but cannot recall if that email included mailing information or not. Either way, this project is an incredibly cool project and I’m interested to see how it unfolds! There are far too few resources for those of us who gobble up any opportunity to do something real, educational and creative like this. I can’t wait to roll up my sleeves and dive in. I’m sorry. I don’t know where that line came from. I didn’t write “Your comment is awaiting moderation.” I wonder who did. I merely wrote into this same box. Now I wonder what comments will come up in addition to what I have written. It is a response from this website I got the same thing after mine don’t worry about it. I’d love to try the old patterns–I could use a time era appropriate outfit when I give tours at our local museum! Well, I think it’s a brilliant marketing idea! You get not only the initial announcements out, but more buzz every time someone blogs, for four months. As for being in business, I don’t think there is anything wrong with producing a good product, selling it, marketing it, profiting from it, and being up front about that. The personal motivation idea never occurred to me, to be frank. I spend at least two years on every book (unless it’s a second edition), and I spent seven years on The Lady’s Stratagem, four of them full time. I just plug ahead, without worrying about how long it will take. and without wanting anyone to see the project. I meant your comment of course, not your email. Sorry about that. Nice to see you here. Have not seen you in a very long time, not since the Reenactment Ladies on line! I always enjoyed chatting with you. I am pretty sure I have all but one of your books, they are excellent reference for me. It would be exciting if you would join us in this en-devour! 🙂 I was glad Janyce wanted me, I have been with her almost since the beginning and I have made gowns from original patterns before. You are correct in this being a fabulous marketing idea! Janyce may not have expected it “explode” like this, but the Titanic Era has always been very “big”, so the response was to be expected. It is amazing how many people from different sewing backgrounds that have replied though. This will be very exciting for all involved. It will also be a wonderful business opportunity for Janyce. I am sure there is someone out there that could even do the translating for her. Frances, I didn’t dare suggest you join this project, but since Joy did, I agree with her, it would be exciting to have you participate. The visibility for your books will be great, and I read and hear they are excellent. They deserve to be put up front for those who are in that type of sewing activities to see. Thanks for inviting me, guys, but I am working more than full time on a book already. This is so exciting as I am one of the 100 year old Titanic Cruise people. I would love to learn to sew. What a cool project! And I just really like the outfit shown at the top of the post. Why don’t we wear clothing that gorgeous any more? I want to wear that! WOW! I try to make my own patterns after seeing vintage garments in the movies… It would be so much better to sew from actual vintage pattern. I am so excited that we can take a step back in history to do this project. There are too few resources for those of us who are skilled seamstresses and tailors to really enjoy stretching and flexing our historical muscles in such a cool project. This one will have my full attention. I am so sorry to hear about this! I share your enthusiasm for multiple needlework disciplines! I am a brest cancer survivor who struggled my whole life to draw and paint and sew..aspire..only to have a surgeon damage the use of my hands etc. My hope and well wishes to you! I understand that, Jill. Thankfully, no one has taken away my hands YET! I have numerous physical problems that get in my way of sewing on certain days. Bother my job, etc. Even got me fired from a very good paying job 2 years ago. But that is in the past and we must trudge forward in life. I can still sew and that is what I do. I just wished that sewing would be able to make more money. This poor one lady team is just too slow! I am happy you both are so aspired to do this project this year. It means you are in the right frame of mind to try something resplendent and breathtaking! I thing we will all LOVE it so very much that we will do more then we think possible for us, all because we are getting so much enjoyment from this project! I would love to participate in this project. Since my husband is a big fan of “gentlemanly dressing”, I would be most interested in men’s wear, i.e., gentlemen’s jackets, pants, and accessories. But please count me in for women’s fashion, too. I particularly love the vintage skirts and jackets. This will be fun. I would love to be a part of this project! I am willing to try both ladies’ and mens’ fashions (I got my husband to agree to model!). I have been sewing for over 30 years. As a post-baccalaureate student, I worked as a stitcher in the costume shop of the Theatre Arts Department of my alma mater. I am currently a volunteer costumer with a local playhouse, so I especially enjoy the opportunity to sew from scratch, rather than just do alterations and mending (and believe me, there’s a lot of that in theatre!). I don’t currently have a blog, but I’m willing to post on the website or comment via email until I do have one. It’s “sew” exciting to see this project take on a life of its own as it gathers momentum! I can’t wait to get started! By the way, I found this opportunity by chance when I Googled “reproduction 1912 sewing patterns,” as I was looking for more sources for patterns than just Folkwear has to offer. I may be able to help with some of the language translation as well 🙂 I am currently brushing up on my French language skills, and wake up every morning to Radio Canada’s Espace Musique (which I highly recommend!). I am interested in participating if you have any patterns for girls (6 years and younger or infants). I also do Irish Crochet, so if any of the garments need to be embellished that way, I would consider that a plus. I don’t currently have a website but am planning one soon. I linked to my blog post about the project in my comment. It says waiting for moderation. Do you think it went to your spam folder? I love this era very classy! I own a 1921 Montgomery Catalog and I recreated a dress from one of the pictures. Was a fun project. I love to look through it to see the prices and styles. I would like to participate in the 1912 project. I am a textile conservator with some experience restoring garments of this period, and I would enjoy the opportunity to work with the original patterns. Thanks for coming up with this excellent idea! Just received notice that I am in group nine and that patterns will begin to flow out soon. Excitement builds. My tailoring skills may be seriously challenged to begin with but I trust they will be vastly improved by the time I’m done. I am waffling about whether or not to use my grandmother’s treadle sewing machine for this project. It still sews beautifully but I am running low on needles and don’t know that I can find any more. Anyone have a source for needles for old sewing machines? Yes; I do almost all of my sewing on treadles and can help you with sources. What machine are you using? Go to ebay and search treadle sewing machine needles! All well and good, as long as you know what you need. Machine needles for home machines are pretty much standardized these days at size 15 x 1, but that is not true of many treadle machines. For some of the ones that take a longer needle, the 15 x 1 size can be ‘cheated down’ in the needle clamp to pick up the bobbin thread, but some (especially some rotaries and chain stitch machines) are smaller than that size, so that can’t be done. It helps if you know what machine you have and, ideally, what size needle you need. There are so many different treadle machines out there! If she measures and duplicates it to the seller they might be able to help! I have been looking for a good treadle and want to anticipate these issues, also a good hand crank machine. I know the bobbin cases are very different. I just love the beauty of some of these old machines! I don’t believe I’d order vintage needles from anyone I didn’t know who couldn’t vouch for their newness (thankfully, that’s not an issue), unless you enjoy sharpening and cleaning vintage needles. Hello India! I am in group 9 also!! Nice to see someone else in my group. Are you on Face Book? I am! Are you the lady in Douglas? India, I am in Torrington, WY There is another in Douglas? How fabulous! Are you close by too? Maybe we can all get together sometime soon on middle ground. This is exciting!! This is a site I found. Wow! Thank you all for the treadle machine needle help. We have a New Automatic and a Singer; I’ll check to see if there is any further identification on either. Hey India, I was looking at some of your older posts. The treadle machine sewing…GO FOR IT!! I used to dress out in 186-1880 dresses and just sew in my own home!! Sewing machines came out in the 1840s, but very few people owned them due to the cost. Go with what feels good! If your treadle works, I would use it. I have one, sadly someone had motorized it. I have to get a new belt for it, but I plan to use it anyway. It is cleaned and ready to go!! Till then I am on my Huskvarna/Viking!! Where are you from India? Earlier machines were attempted but I think the first successful machine was about this time..a little earlier? Sewing machines are not my forte. All I knew is that they had been patented by the 1840s. My knowledge is in different area. Thank for the info! Sewing machines are not my forte either but out of curiosity I did some checking….1600’s..1700’s they were showing up on a regular basis. Really fascinating! Where did you get your information that sewing machines came out in the 1600s? I believe that the first one was in the 1840s. I would like to read your research. I googled history of the sewing machine..www.moah.org/exhibits/virtual/sewing.html. There are numerous references. Years ago I took a graduate level course in Medieval Art History at Rutgers University and what I discovered after doing research in museums about the artifacts is..guess what, sometimes things are not quite what popular general info provides. When did we start putting together garments of any kind? I think on a global level. Good luck! Let me recommend someone who can help you: her name is Cindy Peters and her email address is stitchesintime@earthlink.net. She runs a small business in Minnesota, is extremely knowledgable and carries a good deal of vintage parts, needles, bobbins, shuttles, belts, etc…everything you would need. I have been buying things from her for years and she has found the most out-of-the-way stuff for me. Also for more general info, check out (if you haven’t yet) http://www.treadleon.net, a website chock full of information. There is also a mailing list called TreadleOn (you can sign up through the website); it’s a busy list and full of people who are knowledgable and extremely helpful regarding treadle and handcrank machines. I plan on doing my sewing for this project on machines from 1912 — just to keep it real! I have been collecting vintage patterns, dressmaking books..you name it , for about 5 years. I started my sewing machine collection with a New Home Com bi in the 80’s but now have a late 30’s – 40’s machine, a 50’s and a 60’s-70’s. My Mom may give me her singer featherweight. I actually learned on my Grandmothers Singer, 20’s era, with a domed case. When I started reading and collecting the pamphlets from the Women’s Institute of Domestic Art’s and Sciences I decided on doing the same thing, that is to use authentic instructions and machines etc. from the era at hand. My motivation was basically more for my Fine Arts studies and women’s history themes. I cannot believe how much one can learn about human right’s from studying home economics and fashion! I am in group 18! I am in group 7. I know there is one other Group 7 person near my town; anyone else? And has anyone received or downloaded their pattern yet? Hello: I haven’t yet received a pattern, but was just wondering if this is the correct blog to guest blog? AND I LOVE TO SEW I WOULD LIKE TO JOIN THE 1912 PROJECT IF I MAY AND THANK YOU FOR YOUR TIME. Anybody in Group 5 that lives in Mid. TN?